Rickets is a disease that affects the growth of a child or individual because of defect in bone mineralization. There is utmost requirement of vitamin D for the proper bone formation and mineralization and any defect in its production and metabolism will lead to development of rickets. Though there is abundance of sunlight, vitamin D deficiency now emerges as a major health problem in the South East Asian population including India. A timely dental consultation and management is critical for prevention of significant oral findings in the affected individuals. 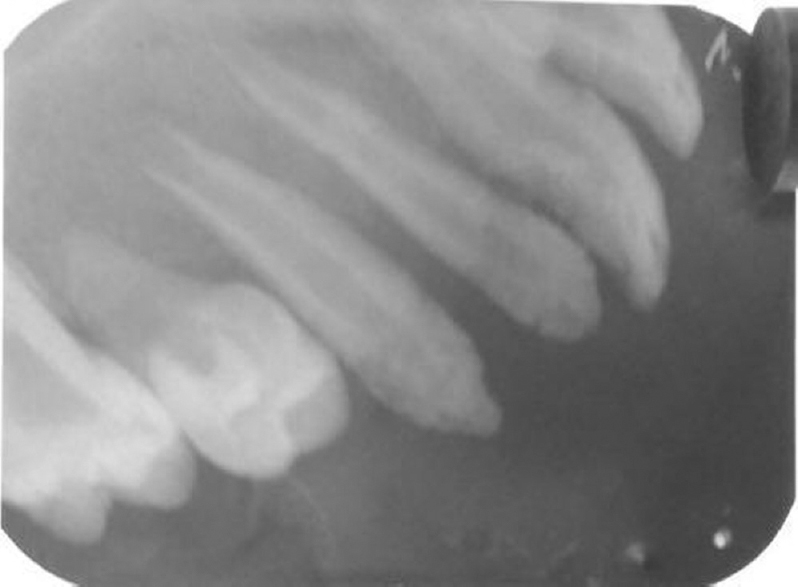 Multiple dental abscesses in absence of caries or trauma is one of the most significant dental findings in Rickets. The goal of early intervention in the treatment of rickets is to minimize the late complications of rickets in affected children. The aim of this case report is to discuss about various oral findings of 17 years old boy suffering from rickets and to raise awareness on dental characteristics of this disorder. Vitamin D not only regulates calcium and bone metabolism but also reduce the risk of malignancies, autoimmune, cardiovascular, and infectious diseases. Its deficiency causes mineralization defects in teeth, leading to poorly mineralized and hypoplastic dentin consisting of calcospherites rather than properly mineralized dentin. The development of tooth and its maturity may affect by both tooth mineralization as well as hypophosphatemia. Rickets affects the developing tooth with enlarged pulp space and high pulp horns that extend beyond the dentinoenamel junction in coronal portion. Microscopically, there is a developmental defect in the dentine leading to clefts and microcleavage which make pathways for the entry of microorganism into pulp. This eventually, leads to the formation of characteristic spontaneous periapical abscess without dental caries or trauma. The enamel is relatively thin, hypocalcified or hypoplastic. Early diagnosis is essential to minimize the morbidity of dental structures. A 17-year-old male patient reported to the Department of Oral Medicine and Radiology with a complaint of severe pain in the upper right region of the jaw. The patient was diagnosed 7 years back with Vitamin D deficiency rickets (VDDR) and had undergone the treatment for the same. There was no genetic history as an examination of additional family members (mother, father, and sisters) gave no evidence of disease. There was no history of any change in the chest shape or spinal abnormalities. On general examination, the patient presented with short stature, bowed legs, enlarged ulnar joint, appeared pale, lean with 32 kg weight, 4 feet height, and body mass index of 22.8 kg/m2 [Figure 1], [Figure 2], [Figure 3]. 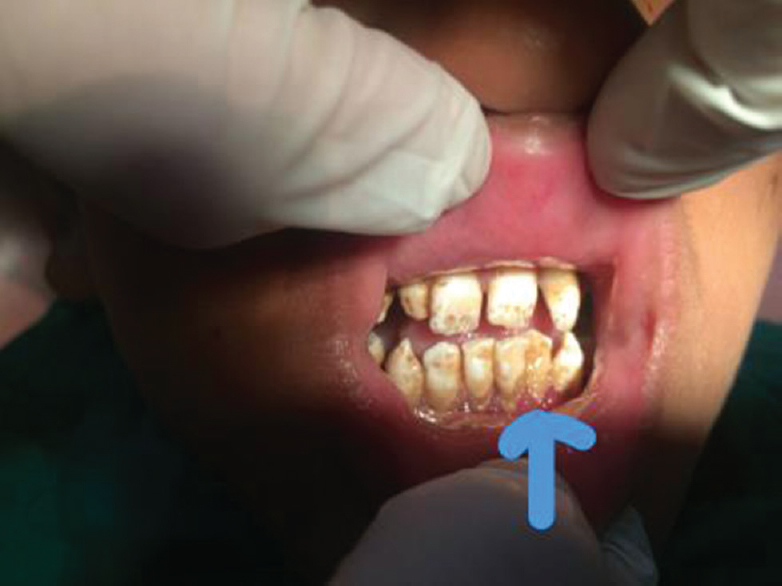 On intraoral examination, the patient presented with localized and inflamed swollen attached gingiva in relation to 13, gingival enlargement in relation to 32 and 33 with generalized periodontitis [Figure 4] and [Figure 5]. Over retained deciduous in respect to 55, 65, and 75 was also present. Generalized chalky white opaque hypoplastic patches were observed on all surfaces of all teeth with generalized yellowish staining and pitting [Table 1]. A tentative, provisional diagnosis of suspected periapical pathology in respect to 13, generalized enamel hypoplasia, generalized periodontitis with partial anodontia were formulated. Further, radiographic investigations of Intraoral periapical (IOPA) and orthophotomograph (OPG) were advised. IOPA reveals the obliteration of lamina-dura in the periapical region with respect to the upper right permanent canine 13 and enlarged pulp chambers, incomplete root formation with ill-defined radiolucencies periapically suggestive of periapical abscesses [Figure 6]. OPG revealed multiple periapical radiolucencies with relation to 32, 42, 12, and 13. A generalized reduced radiodensities of enamel and dentin with enlarged pulp chambers, incomplete root formation in multiple teeth, congenital missing teeth buds with respect to 14, 15, 16, 25, 26, and 35 also over retained 55, 65, and 75 teeth at occlusal level were also observed [Figure 7]. The patient was referred to the respective dental departments for treatment needs and endocrinologist for further management. In India, the prevalence rate of VDDR is approximately 50%–90%, mostly due to dietary or sunlight exposure deficiency. Signs and symptoms of rickets often appear at about 8–10 months of age and manifests as lateral bowing of legs, frontal bossing, and enlargements of the proximity of wrist joint. 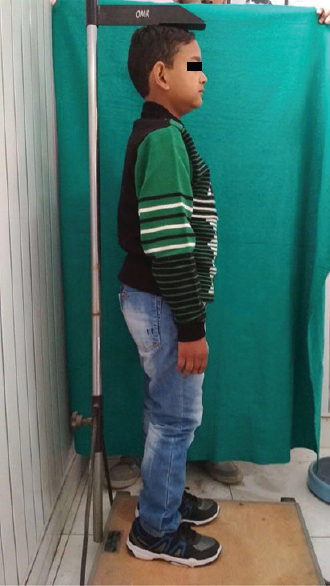 The diagnosis of rickets is made on complete physical and dental examination, confirmed by laboratory examination including serum calcium, phosphorus, alkaline phosphatize, blood urea, and creatinine and 25-hydroxy Vitamin D levels (normal or raised), while the levels of 1,25(OH)2, Vitamin D are normal or undetectable. Dental characteristics of rickets were first reported by Harris and Sullivan. It is responsible for defective teeth mineralization leading to dysplastic dentin with a noncalcified matrix with tubular defects. Early diagnosis of these conditions is necessary to prevent major dental abnormalities and bone deformities. In the present case, the permanent mandibular canine and premolar were showing the internal root resorption and wide pulp canal which could have been prevented to some extent with early diagnosis and proper medical and dental intervention. Although in primary dentition the enamel and dentin formation occur between 4 months in utero and 11 months of age and thus, the defect in primary dentition usually is not preventable. The sequence of abscesses formation usually appears to follow eruption sequence. 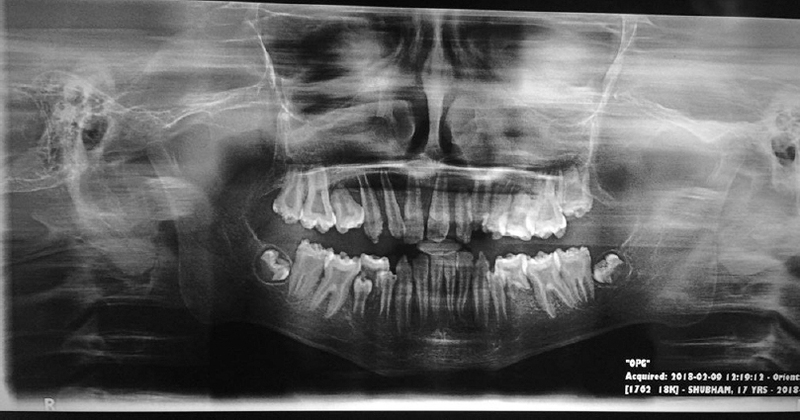 In the present case, there were multiple periapical radiolucencies with respect to 12, 13, 32, and 42. Differential diagnosis in contrast to VDDR includes hypophosphatemic Vitamin D-resistant rickets which has significantly depressed phosphate levels and normal calcium levels whereas 1,25(OH)2 Vitamin D levels are low or in normal range., From dental point of view, dental structural defects, such as amelogenesis imperfect, dentinogenesis imperfect, and dentin dysplasia, should be included in the differential diagnosis. Seow and Latham in 1986 reported dental manifestations with a spectrum ranking from mild to severe based on number of abscesses and radiographic appearance of teeth. Grade III – Extremely large pulp chambers with multiple dental abscesses. Thus, the present case suggests more of Grade II variety. Management includes providing dietary and commercial Vitamin D and calcium supplements. The main management strategy for the dental manifestations is the prevention of dental periapical abscesses because of pulp exposure, through a prophylactic pulp therapy, pulpotomy, pulpectomy, coverage of molar teeth with stainless steel, and restorations with composite and resin cements.,, Topical fluoride applications, pit and fissure sealants for esthetics and caries treatment, extraction of teeth with periradicular abscesses, and eventual restoration with implants. Rickets can severely affect the developments of the tooth, and this condition becomes more accentuated by the patient's negligence toward the dental health. It requires effective medical strategies as well as multidisciplinary approach including dentist toward the defect. Early intervention must be required to prevent more complication in the future. Balasubramanian S, Dhanalakshmi K, Amperayani S. Vitamin D deficiency in childhood-a review of current guidelines on diagnosis and management. Indian Pediatr 2013;50:669-75. AL-Jundi SH, Hazza'a AM. Dental development in patients with hypophosphatemic rickets. Int J Clin Pediatr Dent 2010;3:1-4. Tumen EC, Yavuz I, Tumen DS, Atakul F. Dental and histologic findings of X-linked hypophosphataemic Vitamin D-resistant rickets: A case report. J Int Dent Med Res 2008;1:37-42. Batra P, Tejani Z, Mars M. X-linked hypophosphatemia: Dental and histologic findings. J Can Dent Assoc 2006;72:69-72. Goodman JR, Gelbier MJ, Bennett JH, Winter GB. Dental problems associated with hypophosphataemic Vitamin D resistant rickets. Int J Paediatr Dent 1998;8:19-28. Hernandez GG, Laguna FB. Dental characteristics of hypophosphatemicrickets. Case report. Rev Odontol Mex 2013;17:101-8. Zargar AH, Mithal A, Wani AI, Laway BA, Masoodi SR, Bashir MI, et al. Pseudovitamin D deficiency rickets – A report from the Indian subcontinent. Postgrad Med J 2000;76:369-72. McWhorter AG, Seale NS. Prevalence of dental abscess in a population of children with Vitamin D-resistant rickets. Pediatr Dent 1991;13:91-6. Murayama T, Iwatsubo R, Akiyama S, Amano A, Morisaki I. Familial hypophosphatemic Vitamin D-resistant rickets: Dental findings and histologicstudy of teeth. Oral Surg Oral Med Oral Pathol Oral Radiol Endod 2000;90:310-6. Rathore R, Nalawade TM, Pateel D, et al. Oral manifestation of vit D resistant rickets in orthopantomogram. BMJ Case Rep Published online: doi:10.1136/bcr-2012- 008318. Seow WK. 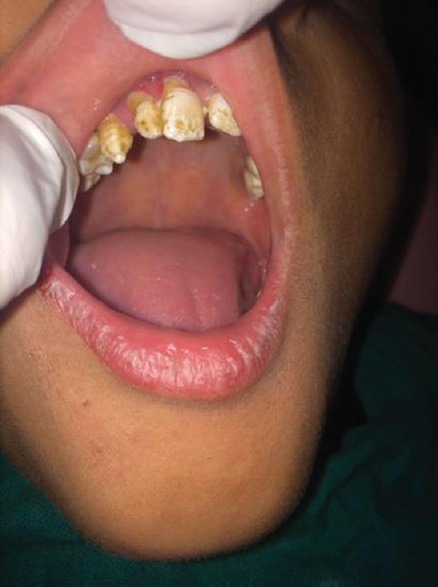 Diagnosis and management of unusual dental abscesses in children. Aust Dent J 2003;48:156-68. Seow WK, Latham SC. The spectrum of dental manifestations in Vitamin D-resistant rickets: Implications for management. Pediatr Dent 1986;8:245-50.